Between 2012 and 2014, the Cardinals had six first-round picks. They spent five of those picks on pitchers, three from college and two from high school. The strategy — overseen by scouting director Dan Kantrovitz, now assistant general manager in Oakland — is an interesting one, as most franchises attempt to load up on cornerstone bats to contend. Of the five pitchers selected, though, only Rob Kaminsky — traded for Brandon Moss — has failed to reach the majors thus far. Marco Gonzales is also gone from the Cardinals organization, departing in a trade last season for “a dense pillar of meat” in Tyler O’Neill. The other three picks are current employed as members of the Cardinals rotation. Michael Wacha – The top Cardinals selection in 2012, Wacha made the majors about a year after being drafted. Only health has prevented him from making more than the 121 starts and producing more than the 11.5 WAR over the last five years. Luke Weaver – The first pick by the Cardinals in 2014 out of Florida State experienced some ups and downs in his debut during the 2016 season, overcame some hurdles in a promising run during 2017, and has recorded solid numbers this season, now totaling 2.9 WAR in just 144 big-league innings. Jack Flaherty – Picked seven slots after Weaver, the high schooler has zoomed through the Cardinals system without much fanfare despite considerable success. He made his debut at 21 years old in 2017 and, in 2018, is proving he belongs. Not included in the group above, but acquired during that time period for a near-million dollar bonus, is Alex Reyes, who was signed out of the Dominican Republic at the end of 2012 after moving from New Jersey to avoid the draft. With those four pitchers, plus Carlos Martinez (currently on the disabled list) and the surprising Miles Mikolas, the Cardinals have enviable depth and maybe the right situation for a six-man rotation. While acknowledging the influence of recency bias on such a claim, Flaherty’s dominant 13-strikeout performance on Sunday nevertheless suggests the great potential possessed by the 22-year-old. In his run through the minors, Jack Flaherty rarely merited a mention on top-prospect lists. Before he reached the majors, he was never one of the top-50 prospects in baseball. Only Keith Law included Flaherty within a top-100 list in both 2016 and 2017. John Sickels and Jonathan Mayo placed him near the end of the top-100 in 2016, but Flaherty didn’t make the cut ahead of the 2017 season. He was included among FanGraphs’ Just Missed section before 2017 and was ranked No. 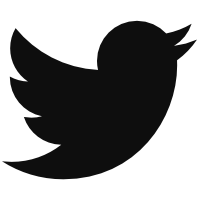 65 this year, roughly consistent with other outlets’ assessments. Watching Flaherty carve up major-league hitters at 22 years old, it is pretty easy to look back with some hindsight and wonder what everyone was thinking the last few years. 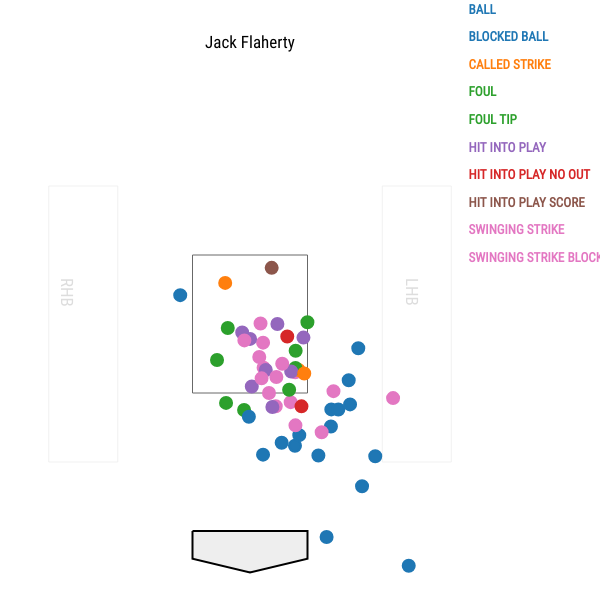 Examining Flaherty’s rise a little bit closer, it is easier to see how his aggressive push towards the majors actually hid his development and projection. After the draft in 2014, the 18-year-old dominated Rookie-level ball over a handful of appearances. In 2015, he was sent to full-season Low-A, but after one start, he was shut down for two months. He eventually made 18 starts, including a strong finish during which he struck out 53 while walking just 10, leading to a 2.60 ERA and 1.91 FIP in his final eight appearances. His performance as one of the youngest players in the Midwest League put him on prospect radars, but he didn’t gain significant traction. Flaherty would start 2016 as one of the youngest players in High-A. He began the season slowly, with a 5.87 ERA but decent 3.54 FIP over his first eight starts. His final 15 starts went better (3.06 FIP and 2.63 ERA). Flaherty wasn’t overwhelming batters, but he had good command, and his performance was notable as he hadn’t been pitching very long, as Keith Law noted ahead of the 2017 season. He’s still learning the craft of pitching, having both played third base and pitched in high school, with limited innings behind him. But he has all the elements you’d want to see in a 200-inning, mid-rotation starter. He just needs experience and some physical maturity to be ready for a major-league role by 2019. After that, the Cardinals made Flaherty one of the youngest players in Double-A to start the 2017 season and he dominated. Within 10 starts, he was in the Pacific Coast League and, with 85.1 innings, he was two years younger than every other pitcher with more than 60 innings in that league. His first six starts in Triple-A weren’t great, with a 4.11 ERA and 5.48 FIP, but like everywhere else, he made the necessary adjustments. In his next nine starts, he produced a 3.32 FIP and 1.98 ERA. Then he was in the majors. Again, he struggled with the transition, putting up a 6.64 ERA and 5.37 FIP as lefties crushed him. Jack Flaherty was never allowed to dominate any level of the minor leagues for long. The closest he came was the beginning of the 2017 season in Double-A, and he lasted just 10 starts there. He’s dominated Triple-A this season when the Cardinals have sent him back down for Adam Wainwright (and John Gant in a spot start when Wainwright wasn’t ready), and now, with what should be a permanent spot in the Cardinals rotation, Flaherty has dominated in four starts in the majors. He’s struck out 30% of batters and walked 8% with a 2.82 FIP and 2.31 ERA in four starts. Eno Sarris noticed last season, Flaherty was getting Kershaw-like results on his slider but noted that, by movement and velocity, the pitch wasn’t elite. Flaherty is still getting great results on the slider with a 27% swinging-strike rate, but it is his command on the pitch that makes it great, not the movement. The graph below shows Flaherty’s slider when he is behind in the count or on the first pitch of an at-bat, per Baseball Savant. On these sliders, the pitch was a ball just 12 of 55 times. Here’s an example of a 0-0 slider to Jorge Alfaro. When he’s behind in the count and needs a strike, Flaherty has little issue with throwing the ball in the zone. 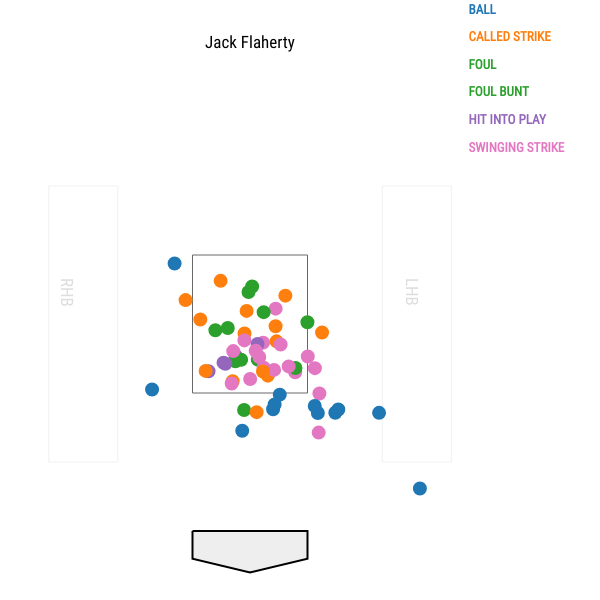 Hitters swing and miss a fair amount at the pitch, anyway, Flaherty having recorded a swinging-strike on 29% of those pitches (59 sliders, 17 whiffs). In these cases, he has basically eliminated the upper half of the strike zone, “missing” only on a back-door ball to Eric Thames, a called strike on pitcher Aaron Nola, and his one blemish on the pitch, a homer to Francisco Cervelli. Despite leaving the zone so frequently, Flaherty has recorded a called-ball rate of just 29% on these offerings, which matches the whiff rate. When batters are ahead and looking for the fastball, the slider fools them. When batters are behind and know the slider might be coming, they can’t lay off and still whiff on the pitch. Here’s Alfaro on an 0-2 count after missing on an inside fastball. If Flaherty just had a slider, he’d probably be a reliever, but he has good command over both his four-seam and two-seam fastballs. His curve and change are both works in progress, but provide different looks for hitters. Flaherty hasn’t solved left-handed hitters and likely needs a step forward from his curve or change, but he’s struck out 12 of the 45 lefties he faced this year after striking out half that many in 46 opportunities last year. Flaherty appears to be gaining confidence as he adjusts to the majors, just like he did on his minor-league stops over the past few seasons. Flaherty is already good. The list of 22-year-olds with 100 innings and an above-average FIP is an impressive one, and a group Flaherty could join. The group of pitchers younger than Flaherty in the past decade to have 13 or more strikeouts with one walk or fewer in a single game consists of only Madison Bumgarner, Jose Fernandez, Clayton Kershaw, Shelby Miller, and Stephen Strasburg, according to Baseball Reference. Flaherty’s age, as well as his ability to learn and adapt with relative inexperience, suggests there might be another level the righty can reach as the Cardinals try to regain their competitive edge through drafting and developing arms — even as the rest of baseball takes the opposite tack. We hoped you liked reading The Underwhelming Jack Flaherty Is Overwhelming Hitters by Craig Edwards!